The Flight School Instructor who added improved his Mile Run (9:15 to 7:00) Decreased body fat 4% and increased his Clean (185 to 215) by becoming a Garage Gym Athlete. Pat is from Pensacola, Florida, been married for two years and has a five month old boy. Introduced to the garage gym from a young age by his father, and has been pursing his own garage gym for seven years. He love the freedom and versatility of having a gym in my garage. Pat has done the Hard To Kill and Shred tracks. They worked great in helping him attain certain goals whether it’s gaining in strength or getting leaner. The straightforward approaches in these tracks allowed freedom to complete a workout efficiently and effectively. Pat is most proud of his BMX racing accomplishments: 6th place at the 2016 World Championships and 4th overall in USABMX rankings 2016. He prides himself in his consistent pursuit of fitness and maintaining this lifestyle for my family to emulate. Pat is a Navy flight school instructor who grew up training in his garage and racing BMX bikes since he was nine years old. His dad has a garage gym at their house that they used and trained early on. His training has been centered around his biking and how to improve that. Pat went to the Naval Academy where his bike training took a break and he became more of a runner. After the Academy he became a helicopter pilot. The same way Pat’s dad passed on his training passion on to him, he tries to pass it on to his son. Taking him on hikes and runes and going mountain biking. 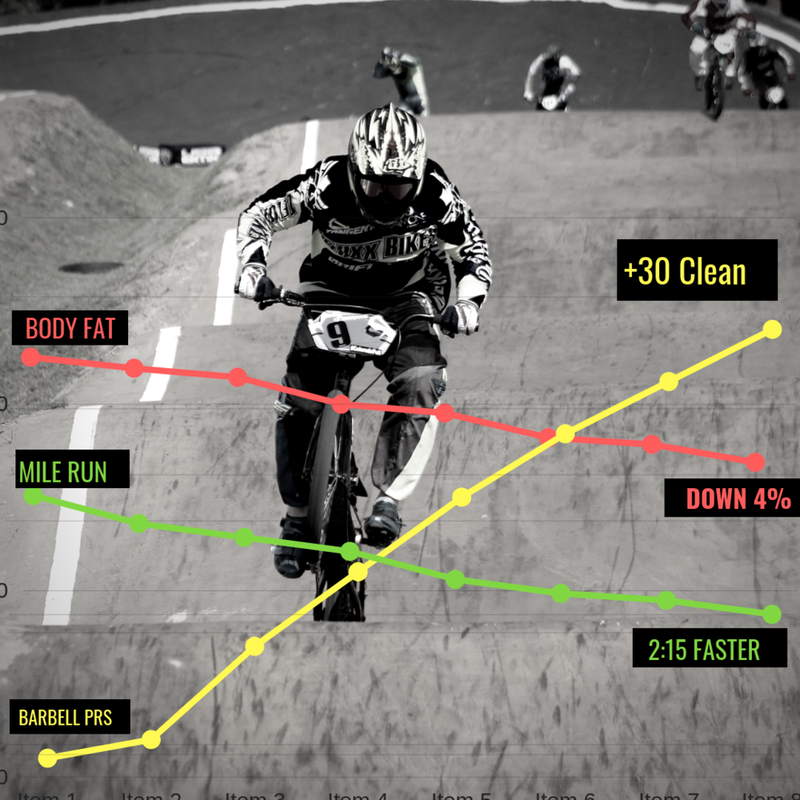 While training for BMX specifically he does a lot of plyometrics and dynamic effort training. Training in his garage allows him the freedom to do all of the exercises and circuits that regular big gyms may not be made for or allow. Pat is training to not only qualify for the world championships (BMX) but also to do well in his age group. Once Pat started to go ‘beyond training’ and really honed in on his mental ability, he started to see phenomenal results!